YOU’RE CURRENTLY READING: My bedside table is mostly aspirational, and I have far more books on it than I’m actually engaged with, but the two I am currently reading are Walkable City by Jeff Speck and Granta magazine’s India issue of stories. THE THING THAT DREW YOU TO THEM: Walkable City came about from a conversation with my roommate who is an urban planner. I asked him what the 21st-century follow-up to The Death and Life of Great Cities was, a book I loved that helped me understand what is great about urban areas. Granta’s India issue has been on my list ever since it came out. Granta does a really nice job of focusing on one country and finding young fiction and nonfiction writers from there and dedicating an entire issue to them. The India issue was a no-brainer given my interest in South Asia. 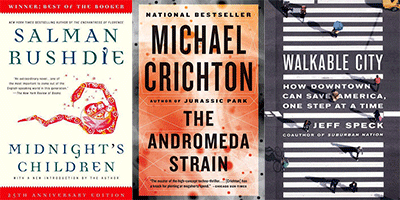 FAVORITE BOOK FROM CHILDHOOD AND WHY YOU LOVED IT: I was weirdly really into Michael Crichton as a child, and if I remember correctly, my favorite of his was The Andromeda Strain although I can’t quite remember why that one in particular. PEOPLE WOULD BE SURPRISED TO KNOW I’VE NEVER READ… Ha! This question is like that apocryphal story of the English professor that had never read Hamlet and when his department found out, he didn’t get tenure! Probably India after Gandhi by Ramachandra Guha or any of Amartya Sen’s books. BOOK THAT YOU OWN THAT YOU’D NEVER GIVE AWAY AND WHY: In fiction, it would be Midnight’s Children by Salman Rushdie and nonfiction would be Beyond a Boundary by C. L. R. James simply because they’re my two favorite books. FAVORITE SPOT TO CURL UP WITH A GOOD BOOK: My deck in the summer and a coffee shop in winter. ANY PLACE WHERE YOU FIND IT HARD TO READ? If it’s for work, anywhere noisy, but if it’s for pleasure, the distractions and noise are welcome. NEXT UP: I’m going to be in Mexico City, so I just picked up a collection of short stories called Mexico City Noir. I’ve never read any noir stories, so I’m excited to check them out.